Pōuri – to be dark, sad, disheartened, mournful, sorry, remorseful; to regret; in the dark, not understanding; depressing, gloomy, distressing; darkness, sorrow, sadness, gloom, despondency, desolation, dejection. 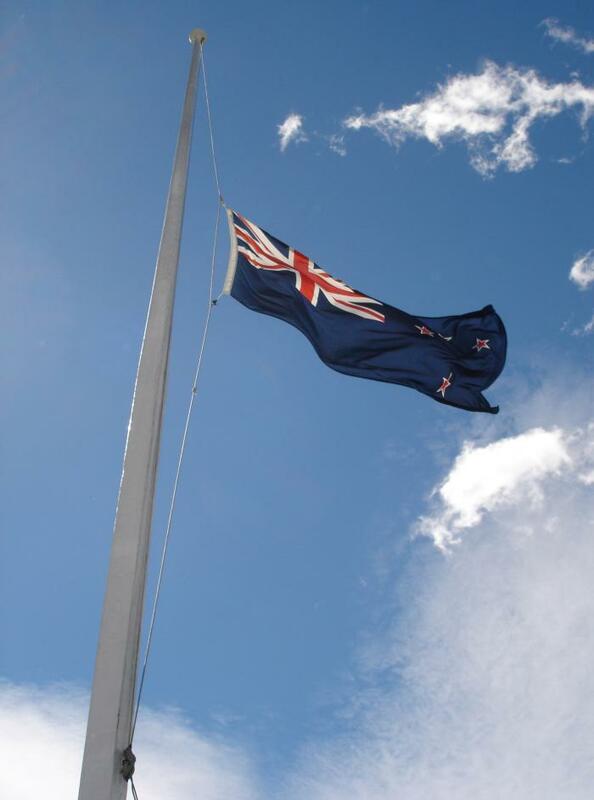 Flags across the country are at half mast as New Zealand mourns the massacre of at least 49 people. There have been two attacks – at the Masjid Al Noor Mosque next to Hagley Park, and at the Linwood Masjid Mosque in the suburb of Linwood. Forty-nine people have died, police have confirmed. 41 at Deans Ave mosque and seven at the Linwood mosque. One person who had been injured has since died. Three others are in custody, but one of these people is not thought to be connected to shootings. But police warn there could be more offenders. . .
Now more than ever is the time to affirm the values that we hold dear – compassion, kindness and tolerance. I have no doubt that all New Zealanders join with me in expressing their condolences and support. New Zealand has long been regarded as one of the safest countries in the world. Terrorism was, until yesterday, something that happened somewhere else. Now it has happened in Christchurch, killing people peacefully at prayer, people to whom New Zealand was home, people who should have been safe here. For the first time New Zealand’s terror alert is at high. The earthquakes that rocked the city were acts of nature. These killings were acts of evil that will leaves scars and change our country forever. 597 BC – Babylonians captured Jerusalem, replace Jehoiachin withZedekiah as king. 37 Caligula became Roman Emperor after the death of his great uncle, Tiberius. 1190 Massacre of Jews at Clifford’s Tower, York. 1322 The Battle of Boroughbridge took place in the First War of Scottish Independence. 1521 Ferdinand Magellan reached the Philippines. 1660 The Long Parliament disbanded. 1689 The 23rd Regiment of Foot or Royal Welch Fusiliers was founded. 1774 Captain Matthew Flinders, English explorer, was born (d. 1814). 1789 Georg Simon Ohm, German physicist, was born (d. 1854). 1792 King Gustav III of Sweden was shot. He died on March 29. 1802 The Army Corps of Engineers was established to found and operate the United States Military Academy at West Point. 1812 Battle of Badajoz (March 16 – April 6) – British and Portuguese forces besieged and defeated French garrison during Peninsular War. 1815 Prince Willem of the House of Orange-Nassau proclaimed himself King of the United Kingdom of the Netherlands, the first constitutional monarch in the Netherlands. 1818 Second Battle of Cancha Rayada – Spanish forced defeat Chileans under José de San Martín. 1839 – John Butler Yeats, Northern Irish artist (d. 1922). 1865 The Battle of Averasborough began as Confederate forces suffer irreplaceable casualties in the final months of the American Civil War. 1872 The Wanderers F.C. won the first FA Cup, the oldest football competition in the world, beating Royal Engineers A.F.C. 1-0 at The Oval in Kennington , London. 1900 Sir Arthur Evans purchased the land around the ruins of Knossos, the largest Bronze Age archaeological site on Crete. 1920 Leo McKern, Australian actor, was born (d. 2002). 1924 In accordance with the Treaty of Rome, Fiume became annexed as part of Italy. 1926 Robert Goddard launched the first liquid-fueled rocket, at Auburn, Massachusetts. 1926 Jerry Lewis, American comedian, was born. 1935 Adolf Hitler ordered Germany to rearm herself in violation of the Versailles Treaty. Conscription was reintroduced to form the Wehrmacht. 1939 Hitler proclaimed Bohemia and Moravia a German protectorate. 1939 Marriage of Princess Fawzia of Egypt to Shah Mohammad Reza Pahlavi of Iran. 1940 Jockey Y-fronts were first sold in New Zealand shops. 1942 The first V-2 rocket test launched. It exploded at lift-off. 1945 The Battle of Iwo Jima ended but small pockets of Japanese resistance persisted. 1945 – Ninety percent of Würzburg, Germany was destroyed in only 20 minutes by British bombers. 5,000 were killed. 1948 Michael Bruce, American musician (Alice Cooper), was born. 1950 Czechoslovakia‘s ministry of foreign affairs asks nuncios of Vatican to leave the country. 1952 In Cilaos, Réunion, 1,870 millimetres (74 in) of rain fell in one day, setting a new world record. 1958 The Ford Motor Company produced its 50 millionth automobile, the Thunderbird, averaging almost a million cars a year since the company’s founding. 1959 EUROAVIA, the European Association of Aerospace students was founded, the first initiative towards European cooperation in Aerospace. 1962 A Flying Tiger Line Super Constellation disappeared in the western Pacific Ocean, with 107 missing. 1963 Kevin Smith, New Zealand actor, was born. 1963 Mount Agung erupted on Bali killing 11,000. 1966 Launch of Gemini 8, the 12th manned American space flight and first space docking with the Agena Target Vehicle. 1968 Vietnam War: In the My Lai massacre, between 350 and 500 Vietnamese villagers were killed by American troops. 1968 – General Motors produced its 100 millionth automobile, theOldsmobile Toronado. 1976 – British Prime Minister Harold Wilson resigned, citing personal reasons. 1977 – Assassination of Kamal Jumblatt the main leader of the anti-government forces in the Lebanese Civil War. 1978 Former Italian Prime Minister Aldo Moro was kidnapped and later killed by his captors. 1978 – Supertanker Amoco Cadiz split in two after running aground on the Portsall Rocks, three miles off the coast of Brittany, resulting in the 5th-largest oil spill in history. 1983 Demolition of the radio tower Ismaning, the last wooden radio tower in Germany. 1984 William Buckley, the CIA station chief in Beirut, Lebanon, was kidnapped by Islamic fundamentalists and later died in captivity. 1985 Associated Press newsman Terry Anderson was taken hostage in Beirut. 1988 Iran-Contra Affair: Lieutenant Colonel Oliver North and Vice Admiral John Poindexter were indicted on charges of conspiracy to defraud the United States. 1995 Mississippi formally ratified the Thirteenth Amendment, becoming the last state to approve the abolition of slavery. The Thirteenth Amendment was officially ratified in 1865. 1997 Sandline affair: On Bougainville Island, soldiers of commander Jerry Singirok arrested Tim Spicer and his mercenaries of the Sandline International. 1998 Pope John Paul II asked God for forgiveness for the inactivity and silence of some Roman Catholics during the Holocaust. 1999 – NZHistory.net.nz was launched. 2003 – The largest coordinated worldwide vigil took place, as part of the global protests against Iraq war. 2005 – Israel officially handed over Jericho to Palestinian control. 2014 – Crimea voted in a controversial referendum to secede from Ukraine to join Russia. 2016 – A bomb detonated in a bus carrying government employees in Peshawar, Pakistan, killing 15 and injuring at least 54. 2016 – Two suicide bombers detonated their explosives at a mosque during morning prayer on the outskirts of Maiduguri, Nigeria, killing 22 and injuring 18. You are currently browsing the Homepaddock blog archives for the day Saturday, March 16th, 2019.